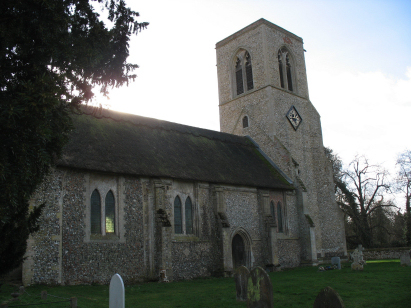 The parish of Rushford lies in southern Norfolk, indeed it forms part of the border with neighbouring Suffolk. Rushford is a relatively modest place sitting on the banks of the Little Ouse River about 4 miles east of Thetford. There is not much of a village at Rushford, merely a row of cottages along a lane leading south from the A1066 road (Thetford to Diss) towards a crossing of the river, otherwise it consists of scattered farms among the trees of Thetford Forest. The dry soils of Breckland lead to extensive sheep & rabbit husbandry as well as today's forestry operations. Rushford has historical connections with Gonville college of Cambridge, the former college at Rushford sits, much modified, to the south of the church. St John the Evangelist's church sits to the west of the lane through Rushford and is accessed by a narrow side branch (Church Lane) The church originated at the church of the College of priests founded by Edmund Gonville in 1342. 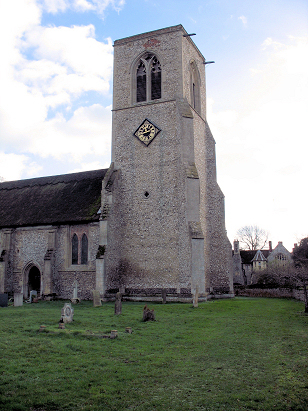 The original building was a cruciform church of which the present day nave and tower are the only remaining portions. The college was surrendered to Henry VIII in the dissolution and the chancel and transepts were demolished at that time. There was a severe restoration in 1585 and also a major event in 1904 which drastically altered the building leaving it as it stands today. The churchyard is graced by a very attractive lychgate and is a secluded and quiet place indeed. A single standard 800-entry register book covers the period of this transcript and runs onwards for completion to the late 20th century reflecting the small population of the parish. This register is filmed on Microfilm MF1622 in the collection of the Norfolk Record Office which was used to prepare this transcript. This film is a relatively recent one and benefits from the improved results now obtainable, the transcript was, as a result, a straightforward piece to prepare.